This post contains affiliate links. You can learn more about their use here! It took me ages but I can finally cross Finland off my bucket list! I visited the country with the Nordic Blogger's Experience* last month and got to experience some pretty stunning places. First and foremost, however, I got to visit the Nordic capital city that everyone in our Scandinavia & Nordics Facebook group is always raving about: gorgeous Helsinki! 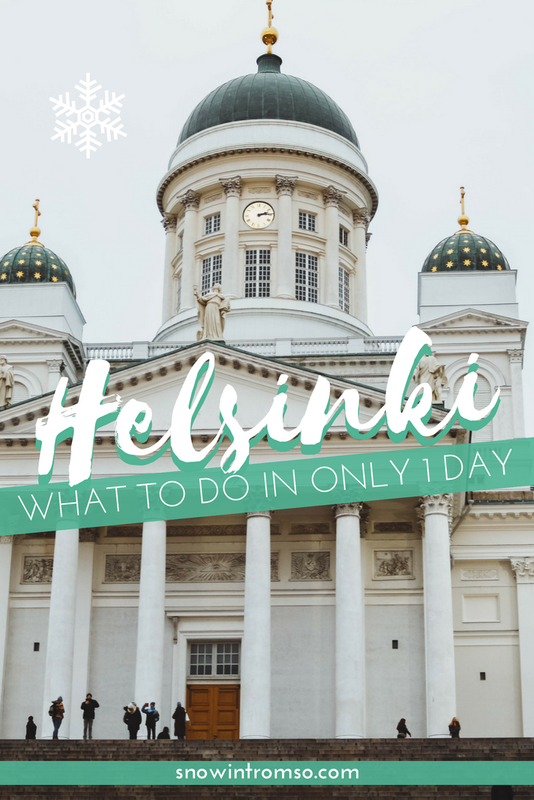 In this post, I'd like to take you on a quick tour around the city by means of my new vlog, and give you suggestions on what to see, do and eat if you only have one day in Helsinki! *Snow in Tromso was kindly hosted by NBE – Nordic Bloggers’ Experience on this trip. All opinions, however, remain my own. The capital of Finland with its roughly 600,000 inhabitants is a rather small capital city, making it easy to explore even if you only have one day! Most sights and attractions are situated in the city center, close to the harbor, which can easily be explored by foot. Mind the black ice though, if you're visiting in winter! As I spend the first half of my stay in Helsinki with my friend Christina (who's lucky enough to call the city home), and the second part with NBE Finland, I didn't actually read up on things to see and do beforehand. However, there was one sight I already knew about as literally everyone seems to be raving about it: Suomenlinna! This little island and sea fortress just a stone's throw (okay, a 20min ferry ride) from Helsinki is one of the most visited attractions of the city and I'd love to see it in summer! In January, which is when I visited, however, it was quite empty and a little bleak. Then again, the ferry to the island was packed with people, yet once we arrived on the island, the crowds all seemed to magically disappear. Plus, the ferry ride through the almost frozen Baltic Sea is something you simply don't get to experience in the summer! How to get there: Take ferry no. 19 from Kauppatori (the market square at the harbor). In winter, it only runs 1-2 times an hour, so make sure to check the schedule beforehand. You can find more information here. Note: The ferry to Suomenlinna and entrance to Suomenlinna Museum is free with the Helsinki Card! ﻿When to visit: No matter whether you're visiting in summer or winter, you can beat the crowds by visiting first thing in the morning - and if you're lucky, you might get to experience a lovely sunrise as well! Another must of Helsinki is the white cathedral that you've surely seen before! Built in the 19th century, the cathedral has now become the flagship of Helsinki and you haven't really visited the city unless you've been here for a quick photo stop! How to get there: All major tram lines (2, 4, 5, 7) either stop nearby at Senaatintori or right in front of the cathedral at Hallituskatu. Uspenskin Cathedral is another architectural highlight of Helsinki and worth a photo stop to admire the cathedral itself and the view over the city. This Orthodox church is as old as Helsinki Cathedral and became the cente of news attention when an icon was stolen from there in 2007. The Old Market Hall of Helsinki dates back to 1888 and isn't only an architectural masterpiece but also a foodie heaven. Whether you're looking for Finnish cuisine and would like to try reindeer meat, or whether you're just curious to browse the different stalls, the market hall definitely has something for everyone and is a great place to warm up in winter! If architecture isn't quite your thing and you're looking for something more adventurous, you might want to check out Helsinki from above. With FlyTour Helsinki, you can embark on a 4-dimensional flight over Helsinki - that is to say with 3D glasses and moving seats - and that way see all the main sights of the city in a mere 10min. Don't do it if you're prone to motion sickness, though! Something that might make you less dizzy, but only if you're not afraid of heights, is the SkyWheel. Chances are that the Ferris wheel at the harbor is the first thing you spot once you get down to the waterfront anyway, and I'm sure the views won't disappoint. They even have a sauna cabin - how cool is that?! How to get there: Both, FlyTour & SkyWheel Helsinki are just a 10min walk from Helsinki Cathedral and situated at the upper market square of the city. More information: For opening hours and prices, check the websites of FlyTour Helsinki and SkyWheel Helsinki. Finns love their saunas - and jumping into the ice-cold ocean afterwards! Admittedly, that doesn't quite sound like fun but trust me, the water doesn't really feel that cold after you've been to the sauna. In fact, the Baltic Sea has a temperature of around 0 degrees in winter, while outside temperatures could be -15 or lower - so actually, the ocean is quite warm... relatively speaking! Come on a tour with me! You can book a 3-hour layover tour of Helsinki here! Helsinki is a wonderful place for any vegetarian/vegan and/or someone suffering from food allergies! Coming from Norway where veggie (let alone sugar-free) options are limited, Helsinki really was a foodie heaven for me! Before embarking on my trip, I've heard Finnish cuisine being described as boring. While I did eat enough salmon during my time in the country to last me an entire year, I actually visited quite a few amazing restaurants serving absolutely delicious food in Helsinki that I'm sure you'd like as well! Faro is a bistro situated next to a channel and thus has an amazing view (not so much in winter as it's dark in the evenings but in summer for sure). They serve plenty of seafood and meat but also veggie meals such as spinach ravioli and halloumi salad. Their prices are quite decent (for Helsinki anyway) with most meals ranging between 20€ and 30€. Roster Helsinki is situated a stone's throw from Helsinki Cathedral and it aims to be different than any other restaurant! Their kitchen is open so you can watch the chefs prepare your meal if you want, and their lunch menu changes weekly. We had salmon for lunch (which was yummy!) but their menu also has veggie options and the staff is happy to cater for any allergies as well. My friend Christina actually suggested having dinner at Konstan Möljä and I'm glad we went! This restaurant west of the city center gives you the chance to try your way through traditional Finnish cuisine at an all-you-can-eat-buffet for only 20€! It's great if you'd like to try lots of different dishes and there's plenty for vegetarians as well. From Karelian pies to reindeer meat, salmon, boiled potatoes, potato mash, potato bake, fish soup, chicken legs, herring and different salads - if you can't find something you like here, you're the pickiest eater of them all! And the best thing? The restaurant is pretty old-school with pictures from the olden days on the wall and a maritime interior, which makes it super cozy! The Clarion Hotel Helsinki has a sky bar, which is great for sipping cocktails with a view! It was jam-packed on a Saturday night (of course!) so if you decide to go, maybe do so on a weekday instead! Looking for a place to stay in Helsinki? Hope this helps! I love staying at Scandic hotels as I always know what to expect from them: a cozy room and an incredible breakfast buffet! Scandic Park was no exception to the rule - in fact, I think the room I stayed in was the loveliest I ever experienced in a Scandic hotel! Situated with a view of the bay Töölönlahti, Scandic Park made it pretty difficult for me to actually get any work done. Then again, with a couch this cozy and a view this pretty, who could blame me? 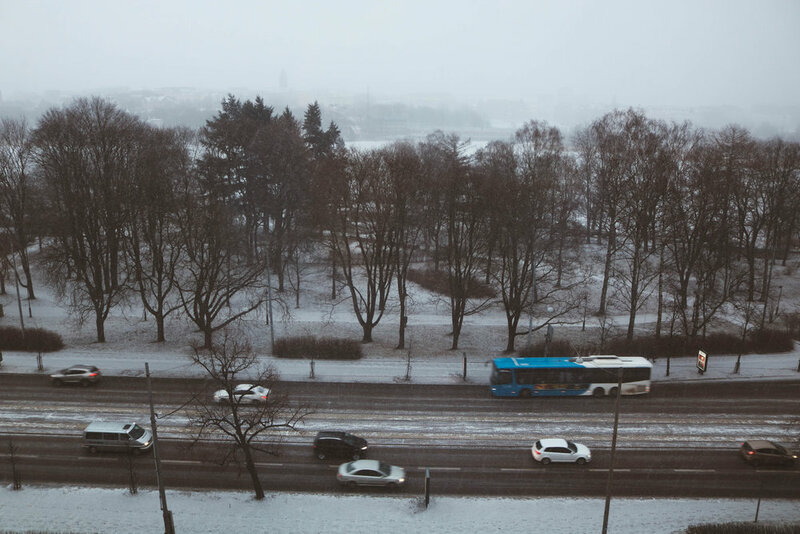 The hotel is only 2 tram stops away from the city center and within walking distance of Finland's National Museum. Before my stay at Scandic Park, I stayed with my friend Christina for 2 nights and had the "authentic local experience"! Besides catching up after not having seen her in 4 years, it was great to hear more about Finnish culture and Helsinki must's from her. Now, you might not know anyone in Helsinki and that's okay. You can just book yourself an Airbnb instead to experience the city the local way! Helsinki Bed & Breakfast is the local version of Airbnb but instead of just providing a room or flat, Helsinki B&B comes with the added bonus of a host who'd like to show you around the city! While you might not even get to actually meet your Airbnb host, at Helsinki B&B, your host is happy to show you the side of Helsinki you want to see. Have you been to Helsinki and have any recommendations to share? Spill your secrets in a comment below!